I received this book from TLC Book Tours for my review. 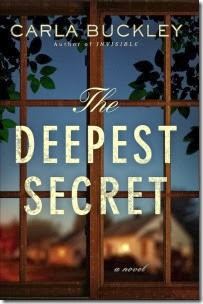 When I was told that The Deepest Secret by Carla Buckley is great for fans of Jodi Picoult, I knew I had to read it. As you know, I love most all of Jodi Picoult’s books, and I loved this book too. A book about a family and their world, a world made smaller due to Tyler’s medical condition, this book looks at people’s motivations for their behavior when it comes to morality and the sacrifices made for family. As the book goes on, it becomes clear that each of the characters, not only the main family, but the neighbors as well, have their share of secrets. What makes it even more interesting is that some of the characters discover things about the other characters, and the things they know, or in some cases, the things they believe, become secrets as well. Without going into the actual story in order to keep that part a secret, this is definitely one of the best stories about a family that I have read in awhile. Every character is important, interesting, and lovely to get to know. If I have made you interested in reading, please leave me a comment and you’ll be entered to win your own copy! This week I also read The Year of Fog by Michelle Richmond. Another family drama, this one was good as well. “Life changes in an instant. On a foggy beach. In the seconds when Abby Mason—photographer, fiancée soon-to-be-stepmother—looks into her camera and commits her greatest error. Heartbreaking, uplifting, and beautifully told, here is the riveting tale of a family torn apart, of the search for the truth behind a child’s disappearance, and of one woman’s unwavering faith in the redemptive power of love.” No one knows what happened to six-year-old Emma. She may have went into the ocean and drowned, but Abby refuses to believe that to be the case. She searches for clues about what may have happened, while also recalling her own childhood and researching the possibilities of memory – hoping to recall anything that may help her in her search. I found myself waiting for the big twist of the book to happen, but surprisingly the book is pretty straightforward, which in the end I was happy about! The end was interesting to me, in that it wasn’t a happy ending for some, but it seemed realistic in its sad way. Have you read anything good lately? Don’t forget to let me know if you want to win a copy of The Deepest Secret!